It was St Patty’s Day with the holiday an enthusiastic crowd gathered at Terrain Race. Many participants sported costumes in honor of the holiday, something that you don’t see as much of anymore. There were also lots of volunteers at registration and in the festival area, which is always a good sign. And of course, there was music! Whatever else a race does, the music makes the atmosphere. Guess I’m just a sucker for the music. After seeing a few familiar faces I headed over to watch the elites go off. I was immediately intrigued with the starting pens. At first, I thought it was a novel approach to having to clear an obstacle before even starting. But it was more than that, the pens were actually pools. And more, it was chilled water, which I never had a chance to see how they were doing that! It certainly wasn’t naturally cool in Miami. Not sure how that plays in Minnesota, but I took a dunk, knowing that even in March, racing in the Miami heat is nothing to take lightly. It was also another way of immediately spreading out the field…although they did have a stretch of running before the first obstacle. According to the race officials, the course was right around 5k and (as if I have to say it again) being flat, it was going to be fast. The elites finished in around 25-30 minutes. Although all the races at Amelia Earhart Park follow a general loop around the big lake, Terrain Race definitely used some deviations from what I’ve seen before. It’s hard to say for certain without a course map…and you would think I had this place memorized by now! Another thing that was different from most other races is that there were no penalties…optional or not. I believe they also had mandatory obstacle completion for the elites (bless their hearts!). 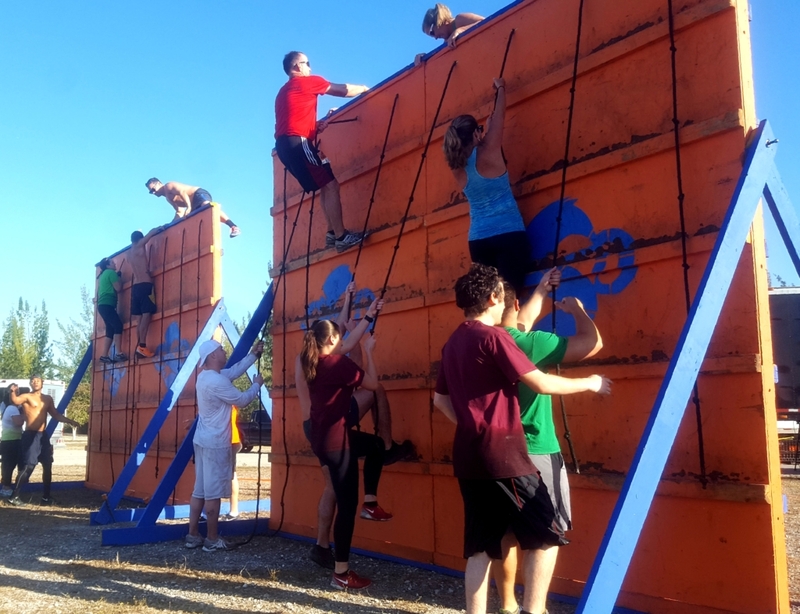 You had unlimited chances…but you had to complete every obstacle…after all, it is Obstacle Course Racing (OCR)! Not having a race map to identify the obstacles does allow me to make up my own names for the various obstacles too. As there were some that I hadn’t personally seen before (another plus to me), I feel an obligation to give them some sort of name. One of them was the Oxen-Yoke Carry. A metal pole with two tires hanging by chains at either end. There were various sized tires but Terrain Race didn’t seem to have a separate gender designation. That seemed to carry through all the obstacles. At the oxen-yoke, I looked to grab the largest tires…well, just because. Unfortunately, it was a mismatched set, which made my carry look like a failed sobriety test on Cops and had other races fleeing for safety! On the fortunate side, this and all the carries were short. This also kept any delays at these carries to a minimum. This worked well at the Wreckbag carry as well, where the bags were light and many racers were carrying two. The bucket carry also came with a twist, as they were open at the top and filled with water. Surprisingly there was very little spillage, but the buckets were about half filled, so it makes sense…although…as I consider that now, maybe that’s because they started out full…which makes even more sense! Ropes, cargo nets, and tires made frequent appearances on the course. The cargo nets had an A-frame climb, an overhead cargo net crawl (with a bit of a hair-raising dismount for me…a somersault from the top into a crowd-thrilling vault, sticking the landing) and another net crawl at the finale following a balance beam climb. Personally, I’m a big fan of cargo nets and similar old-school obstacles. These type of obstacles are also more casual-racer friendly. Speaking of personal favorites of mine, the rope-climb wall. I’ve missed these! It’s a deceivingly difficult obstacle which most people can actually do…giving a nice feeling of accomplishment for those that find some of the other obstacles too much for them. Along the way, there was also a short rope climb and a rope-ring swing…much more difficult than it would appear, but fun to watch. And I mentioned tires! They had a tire drag and tire flip…large tractor size tires that again, were not particularly gender/ability sized. Never fear…there were no penalties or rules for non-elite racers. Find a friend, do it half way or just move on. Another thing there wasn’t…judgment! No overzealous volunteers or racers trying to provide unwanted ‘motivation’. In fact, what I heard throughout the race were people offering shouts of support for anyone doing…well, anything. Then there was the Tire Sledge Drive. Taking a sledgehammer to an unoffending tire and driving it around ten yards away and back. Admittedly, I’m a relatively over-protective parent, so some of the participants would not be playing with my kids…or grandkids. Fortunately, I also swing a mean sledge. 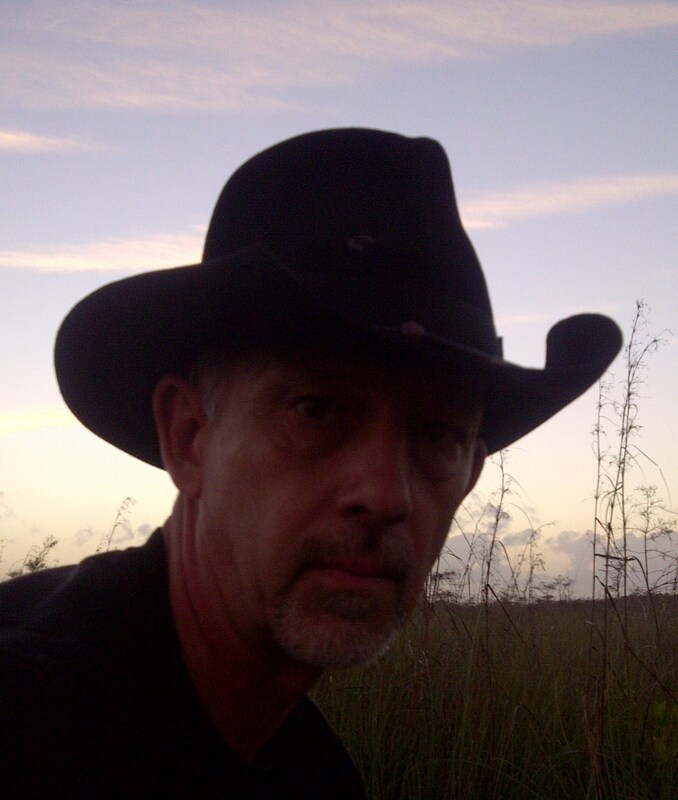 So I was up and back…under par…and ran away from there before anyone could sledge me, accidentally or otherwise (not everything I’ve written has pleased everyone, and not everyone is fooled by my clever disguise…racing as an old man!!!). Also, fortunately, those who would be most dangerous were pretty much exhausted (read: neutralized) at that point. After the Tire Sledge Drive, there was a short rig, one of the more challenging obstacles for those experienced racers. A few minutes later, after a short run, and the Wreckbag carry, we were at the final section. Starting with another of the tougher overhead obstacles, a longer section of inclined monkey bars over a dunk pool. This was the obstacle with the longest delay. Irrelevant if you weren’t running a timed race. Interestingly, no one seemed to care either way! It was a chance to catch your breath if you needed to and prepare for what was likely the most difficult obstacle for many…and the most public. When you fall, everybody was watching! But most people were chatting and patiently watching the racers ahead, as well as the kid's race going on to our left. In fact, it was really a joy to see the kids just out there having fun and doing…well, what kids do. Funny though, it seemed that the faces of the people watching the kids were very much like the faces of the people watching me during the race. “Awww, how cute…they’re trying so hard…just like the grownups!” Obviously, I really need to step up my game….. Overall, for a race that almost wasn’t, my first Terrain Race was a very positive experience, although apparently, I missed the part about getting a timing chip. And while there are always improvements that can be made (engineers are routinely accused of fixing things that aren’t broken…guilty as charged) it was a real reminder of many races I had done early in my racing career. And a reminder that you don’t need a Medieval style city of tents, or a food court, or beer to make it an enjoyable OCR race. Ok…maybe the beer…but that’s probably just me. There was a great atmosphere in the festival area, music, good overall organization, plenty of volunteers and plenty of drinking water on the course. A lesson well learned for a race in Miami…never discount the effect of heat even this early in the year. Not to mention a good OCR race that offered some challenges for the experienced racers while allowing the casual racer a chance to feel the accomplishment of completing an OCR. 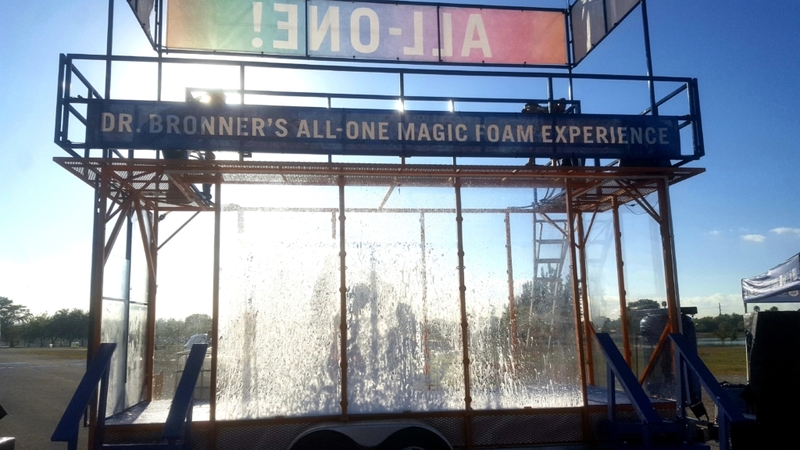 And did I mention the photo booth or the foam bath…well, that was different! While I skipped the foam bath myself, I did make it to the photo booth this time around. It also carried on the trend of group racing. Which also begs the question of how important timed events are when groups tend to stick together anyway. Another trend appears to be Team ATP…the biggest team again today at the Terrain Race. I was fortunate to see Coach Casey finish off her race with a cartwheel across the finish line. If it’s worth doing, it’s worth doing memorably. I’m guessing it won’t be the last time seeing them this year. 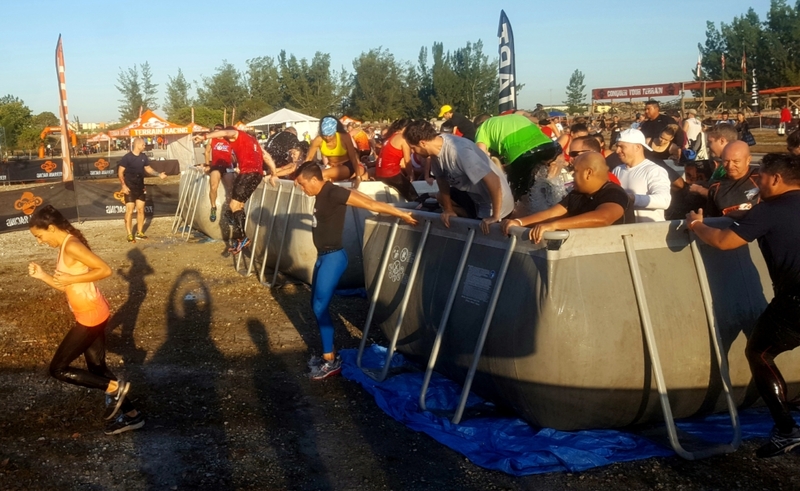 I’m looking forward to my next opportunity to do a Terrain Race and would love to hear from you about your race experience at the 2018 Terrain Race Mud Run in Miami! As a member of the ATP team, thanks for the shoutout! Although I’d be remiss if I didn’t give credit where credit was due, as the great guys at Fit4Lyfe were the actual biggest team (ATP ended up being split between Terrain Race and Savage Race on Saturday). They’re another good local gym, and deserve to be recognized since they earned that Biggest Team award. 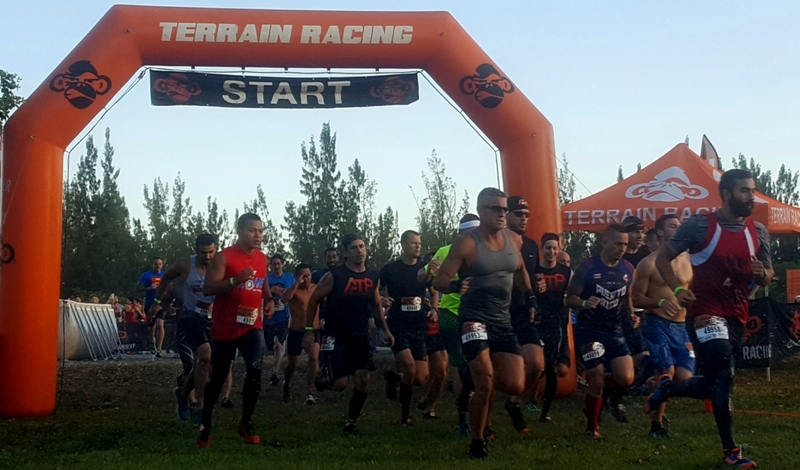 With that being said, Terrain Race advertised throughout that it was a $10 parking fee (same as every other race at this park, which is pretty much the only venue in South Florida with multiple races – Spartan was $10 just a few weeks prior). However, once we got to the venue, the volunteers were charging $15. If confronted with emails or screenshots of the $10 advertised charge, they only charged $10 but asked that you don’t share that information with anyone else. The event page has tons of people complaining about this, and Terrain claims it was always $15 despite confirming on Facebook literally the day before that someone’s comment about it being $10 was correct. Terrain really botched this one on what was otherwise a pretty good race, and they refuse to respond to our complaints about this inflated parking fee. Thanks for the comment Mike…and for the correction on the biggest team. Congrats to Fit4Lyfe…and I will look for them at the next Miami race! I’m also glad you brought up the issue of parking fees. Hopefully Terrain Race will take the time to respond to this. Social media being what it is, sharing is almost a given. It’s happened before that something like this can really detract from an otherwise positive experience!